According to wikipedia, the blog of the white house U.S participated in 2009 so this ain't a small thing. This is major! And the best part is that it is for a good cause. So for me to be a part of such a global event is totally amazzziiiinnnggggg. I hope that by partaking in this event and contributing just a small post that the fight against inequality would be strengthened. So guys please, please and please check out my blog and others involved in this event and be inspired. 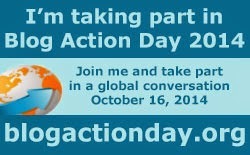 For bloggers who want to join you can register your blog on blogaction.org. Thanks once again to Hoda Katebi, I don't know how you found my blog but I am so glad you did. Thanks for the information I am really grateful. Now I need to go and start writing my post. Remember to keep a date with me on the 16th of October 2014. I think I should join....going to register. I just hope I wont forget o cos my brain of late just decides to shut out somethings and I just forget totally. I need to see a doctor.